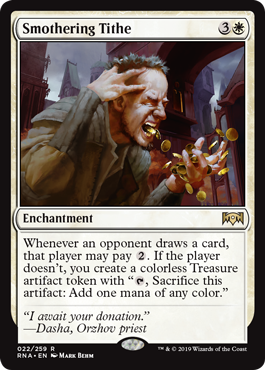 Ravnica Allegiance has some amazing cards, some busted cards, and we’re already getting some interesting price movement on these cards. Let’s not waste any time, and look at what’s jumped and what’s tripped over, fell into a hole, and rolled over to fall into an ever deeper hole. As a bonus this week, there’s some extra-interesting Guilds of Ravnica cards that I think are excellent pickups, since they aren’t rotating out of Standard for another 21 months. Before we get into these too deeply, let’s keep in mind that card prices right now are at a volatile place. This is all pre-order hype, we haven’t opened any packs yet, and at this point in Guilds of Ravnica Arclight Phoenix was a $5 card. There’s plenty of time for these to spike higher or drop lower. Hydroid Krasis (up to $20 from $12) – I said last week this would be $20 at next Christmas. I still believe that, but as you can imagine I’m not high on buying this at $20. I played the hell out of Sphinx’s Revelation, and the secret to that card was the first cast for X at two or three, which found you that bit of gas you needed to get to the backbreakers. Mana acceleration isn’t great in Standard right now, and casting this early hurts. Four mana gets you a 1/1 flier. Six is a 2/2 and one card and one life. Still not great. I don’t think this is Standard gold, but this is the be-all and end-all of what Commander players want to be doing. You’d have to have a very clear reason not to play this in your 99, right? Maybe you run zero creatures? Judith, the Scourge Diva (up to $8 from $2) – She’s a tough act to follow, but her path is clear: all aggro, all the time, and if you wipe the board you’ll pay a price for that too. “Any target” is great, but are we going to see decks with four of her? I get that if she’s staying in play the useless copies in your hand aren’t as awful (and playing the second one means two pings, FWIW) but it’s going to stand in the way of her going much higher. Smothering Tithe (up to $5 from $2) – Your guess is as good as mine. I can’t figure it out. This is Rhystic Study’s less annoying cousin, and while I suspect that the Commander implications are better than they seem, I still don’t know why people are going into a tizzy here. Is it good against control? I suppose more mana is good, but they can pay if it turns into a problem. In four-player pods you can drop an eight-mana bomb on your turn five, but I need a dedicated strategy for this card to make my deck. When you figure it out, let me know. Repudiate // Replicate (down to $2.50 from $8) – I don’t think this was ever going to be an amazing card, but this was a super-high preorder price and it’s a card that’s going to be tough to use in Standard effectively. You want your modal (or split) cards to cover a wide range of cases, but this has two niche abilities that don’t always fit the same deck. 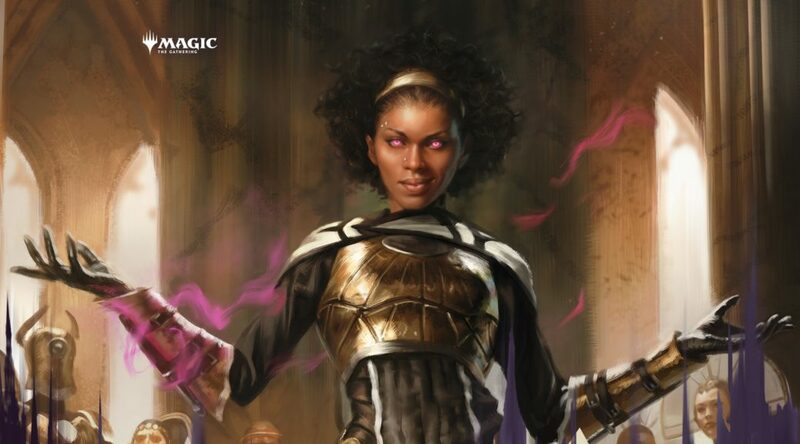 Kaya, Orzhov Usurper (down to $9 from $13) – I wrote last week that I thought she’d stay around $13, and that seems a touch optimistic right now. Looks like she’s going to level out a little lower than I’d expected. Benthic Biomancer (down to $1 from $4) – If a Merfolk deck is going to get there in Standard, now’s the time. The looting doesn’t happen on using the Adapt, it happens when you get the counter, and handily, Merfolk has no shortage of that. There’s a chance, but I’d like that chance a lot better if the UG Merfolk decks could still run Heroic Intervention. Mostly, cards in the set are down across the board, and that’s to be expected. Preorder prices are educated guesses, and a set doesn’t keep a huge number of $5 rares around for long. Chromatic Lantern is at $5/$10 nonfoil, and that’s a full $5 cheaper on the new foil vs. the old foil. It’s a card that ought to get reprinted every few years, so I’m bigger on buying the foils now that they are cheap. Remember how high this got right before the reprint? Even with a Masterpiece floating around, the RTR foil was $30 this summer before the reprint hit. Get your foils now while they are cheap, both for your decks and to trade away when it’s $30 again, because it will be and Commander players will always want them. I’ve written before about Dream Eater as underpriced and underplayed, an opinion I still hold. I’m buying them off eBay for about 75 cents each when I go after them. Arclight Phoenix has also taken a lot of words from me, but please, listen and buy your playset now, before they are $40-$50 this summer. It’s too good in all formats to stay this low. 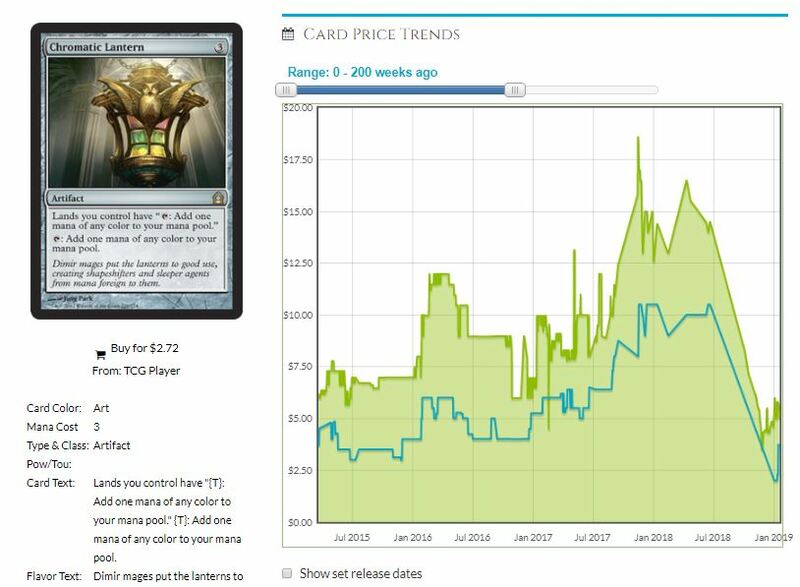 Divine Visitation foils are $13 right now and this is a silly low price for the card that token decks most want in Commander. I even think it’s better than doubling effects, if we’re measuring head-to-head. Experimental Frenzy at $3/$8 foil is good things waiting to happen. I’m about to go on strike, so my card buying is turned off right now. If that were not the case, I’d be hip-deep in these foils especially. It’s going to get broken. Thousand-Year Storm, at the same set of prices, is an ‘I win’ card in the Commander decks that can use it, and the foils here are super tempting, as a mythic even! I think hydroid hydra is gonna be a hit in standard for a while; potentially alongside incubation druid (potentially super busted). The Hydra has shot up in price and I do love what the druid can do. 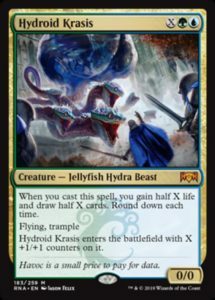 I have a hard time seeing Hydra as a weak Standard card, but it’s truly going to dominate kitchen tables.